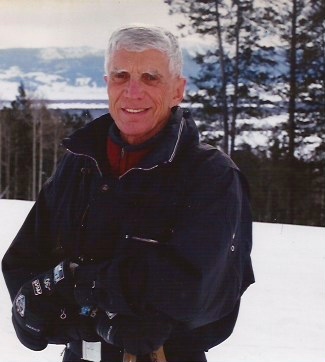 Long time Jackson Hole resident Dietrich Hermann Oberreit passed away peacefully on April 6th, with family at his side. Dietrich was born on March 8, 1924 in Paterson, New Jersey, to Wilhelm Oberreit and Gertrud Louise Limpert. Upon the loss of his father when he was 8 years old, his mother moved the family (Dietrich, 2 brothers and a sister) to Switzerland to be near family. In 1942, when he was 18, they returned to New Jersey via diplomatic exchange on a Swedish ship. He often shared fascinating stories of living in Europe during pre-war and WWII years. Dietrich enlisted in the Navy at Rutgers University. He received his Bachelor of Science in Mechanical Engineering through the Navy’s V-12 program at Swarthmore College, where he was also active on the LaCrosse team. He went on to Columbia University for accelerated officer training where he received a commission as Ensign. As the war ended, he was assigned to an office in New York decommissioning ships, and received an honorable discharge in 1946. He returned to New Jersey as a mechanical engineer for The Bendix Corporation. He joined the NJ Ski Club where he met his German born wife Anneliese. They had three children, Audrey, Clifford and Kenny. Being ‘ski nuts’ they would travel to Vermont on the weekends to ski, and soon were trying to figure out how they could ski and work in the same place. An article in Ski Magazine about a new ski area being developed in Jackson Hole, Wyoming got their attention. In 1965 they headed west to pursue their dream of building and operating a ski lodge and raising their three children in the great outdoors. They put their hearts and souls into managing the Alpenhof Lodge, and brought the kids up working alongside them. The Alpenhof was one of the first hotels at the newly developing Jackson Hole Ski Area in Teton Village, and was built the same year as the aerial tram. Dietrich was a true hands-on entrepreneur, and a savvy businessman. A demanding perfectionist, he carefully selected employees whom he held to the highest standards. He promoted a strong work ethic, with an emphasis on honesty, integrity and ‘The Customer is King’. The hard work, high standards, and blood, sweat and tears paid off as The Alpenhof maintained a 4 Diamond AAA rating and had the only Mobil 4 Star restaurant in Wyoming for many years. He appreciated Anneliese’s knack for entertaining guests which attracted them year after year. He often hired college students who were skiers and would take the guests skiing. This friendly atmosphere created a high rate of return for guests and all became like family. Many of those friendships have endured, and many a local can say they got their start or met their spouse working at the Alpenhof. Dietrich was president of the new Teton Village Resort Association for many years. As one of the first pioneers of Teton Village he contributed to the development and promotion of the resort and helped put Jackson Hole on the map. He was honored on his 90th birthday at the Alpenhof Bistro (formerly ‘Dietrich’s’) with a surprise party and reunion of around 100 former employees and other Teton Village pioneers. He recently celebrated another milestone, his 95th Birthday, with family, friends and caregivers at The Alpenhof Bistro. Dietrich and Anneliese taught their children how to ski and took them on backpacking trips in the Tetons and the Wind River Range. The pair passed on to their children a deep appreciation and love for nature and the outdoors. Dietrich loved taking 8mm movies of the family skiing, which the kids are grateful to have today. He and Anneliese divorced in 1983 but continued to run the Alpenhof together until they sold it in 1988. He had a passion for design, and built and furnished a number of spec homes over the years. In 2004 he took a six year hiatus to live in Hawaii and Arizona. In the spring of 2011, after experiencing some health issues, he felt it was time to come full circle and spend his remaining years near family in his true home, Jackson Hole. Dietrich remained active with the community through the Rotary Club, and skied until he was 90, always stopping for lunch at ‘Dietrich’s Bar & Bistro’ in the Alpenhof. He believed the only way to keep going was to keep going, and took great pride and determination in remaining active and independent by pursuing a holistic lifestyle and regular exercise to keep fit physically and mentally. He stayed abreast of world news and had a memory better than the rest of us. He loved to get out and about, and always enjoyed visiting with those who knew him from ‘the olden days’ working at the Alpenhof. He will be greatly missed by his 3 children and their spouses: Audrey & Jim Sorensen of Jackson, Clifford & Kelley Oberreit of Grand Prairie Texas, Kenny & Kathy Oberreit of Alpine; 7 grandchildren, 3 great grandchildren, many longtime friends and his wonderful team of caregivers. The family is forever grateful to his assistant and lead caregiver Rena, for her loyal friendship and dedication, and the outstanding caregiving team who helped him maintain his quality of life. It seems only fitting that he would leave us not only one day before the anniversary of Anneliese’s passing, but on the closing weekend of the ski season. In lieu of services, family members plan to honor him with a hike up the ski mountain he loved so much, followed by lunch at the Alpenhof in what will always be known to the family as ‘Dietrich’s Bar & Bistro’. Memorial donations may be made in his name to The Rotary Club of Jackson Hole or to the Community Foundation of Jackson Hole. Condolences may be sent to the family online at www.valleymortuaryjackson.com.